August 29, 2009 was the first Carrotmob in Antwerp! The owner of Tugra, a supermarket in the Brederodestraat, promised to invest 50% of all sales that day in environmentally conscious investments in his shop. This simple eco-concept comes from the USA. Everybody shops, but we never coordinate our spending. Why not organize ourselves into a large group and go shopping in the same corner store on the same day? When we do that, we can get a store to invest a portion of our expenditures into energy saving measures. Our money is well spent, the store saves energy and money, and the environment will be better... win-win-win! 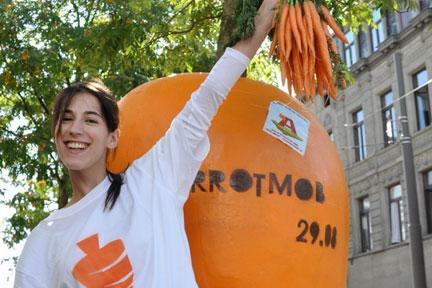 Saturday was the first Flemish Carrotmob... a great success for Antwerp! Nearly 600 customers spent 4000 euros, which means that Tugra Market is spending 2,000 euros on environmentally friendly measures, specifically related to energy savings. After the energy audit performed by Boris Forno Ville we knew that the big energy bottlenecks in Tugra Market were light and refrigeration. The old circuits for the fluorescent lights were replaced, and freezers are being adjusted from -28 ° to -18 °. Additionally, we generated a basket full of dry food and preserves which was donated to the food bank. The grocery store was open from 9:00 to 20:00, which means 0.86 minutes per paying customer.